CHARLOTTE, N.C. CHARLOTTE, N.C. (AP) - -- It finally happened - a 16 ousting a 1 in March Madness. The University of Maryland-Baltimore County stunned the college basketball world by pulling off the most shocking upset in men's NCAA Tournament history, hammering Virginia 75-54 on Friday night to become the first No. 16 seed ever to beat a No. 1 seed. Virginia entered the NCAA Tournament as tourney favorites - the No. 1 overall seed after going 31-2 this season, including 20-1 in ACC competition. And really, who was UMBC anyway - a team most glanced over, or simply didn't know when they filled out their NCAA bracket? But UMBC didn't just beat Virginia, it dominated throughout the second half. Senior guard Jairus Lyles scored 28 points and the Retreivers cruised to an easy victory before racing off the floor together in their yellow-and-black uniforms with one finger pointed toward the sky. "These are the moments that you dream of," Lyles said. Chaminade's 77-72 stunner over Ralph Sampson and then No. 1-ranked Cavaliers in 1982 in Hawaii was generally considered the most remarkable upset in college basketball history. But that was the regular season. The Cavaliers couldn't get anything generated on offense and the nation's top-ranked defense couldn't contain the American East Conference champions who won their conference tournament at the buzzer. "Unbelievable - it's really all you can say," UMBC coach Ryan Odom said. The 74 points were the most Virginia had allowed this year. Virginia had allowed just 54.3 points per game this season, the fewest in the nation. He diced up Virginia's defense in the second half, getting to the hole easily on six different occasions and making easy layups. He also knocked down a pair of 3-pointers as UMBC built a 16-point lead. Sherburne was huge early in the second half and made believers out of everyone. He scored on an and-1 drive and then knocked down a 3-pointer from the top of the key after a behind-the-back pass from KJ Maura. After Virginia made a foul shot, the shifty 5-foot-8, 140-pound Maura drove the lane for an uncontested layup. A Tony Bennett timeout couldn't stop the bleeding, as Lyles hit two more 3's and Sherburne hit one more to extend UMBC's lead to 14 with 14:57 left in the game. Lyles was fouled on a 3-point shot and suddenly the Retrievers led by 16. A corner 3-pointer and a layup off a fastbreak by Arkel Lamer gave UMBC its biggest lead at 67-48. From there, the party was on as chants of "UMBC" rang through the arena. 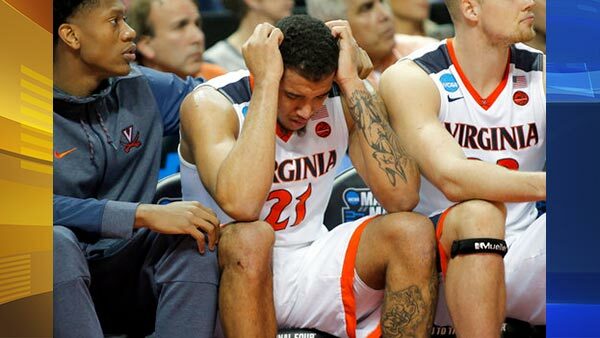 Virginia: This isn't the first time Virginia has struggled as the No. 1 seed. The Cavaliers trailed by five at halftime in 2014 to Coastal Carolina but went on to win 70-59. In 1998, the No. 16 seed Harvard women beat top-ranked Stanford on the Cardinal's home floor.